How can you ensure your MOTOTRBO Two Way Radios, Mobiles and Repeaters are genuine and what are the implications if they are not? While non-genuine/counterfeit radios, batteries, and accessories may look identical to their authentic counterparts, they differ vastly in quality. Non-genuine radio products often house inferior quality components that would question your safety. Unlike genuine products, counterfeits lack product testing and quality control during the manufacturing process. Hence, these products present their users with the dangers of exploding batteries, overheating radios, mobiles or repeaters and short-circuiting accessories that would cause severe burns or result in a detrimental workplace fire. 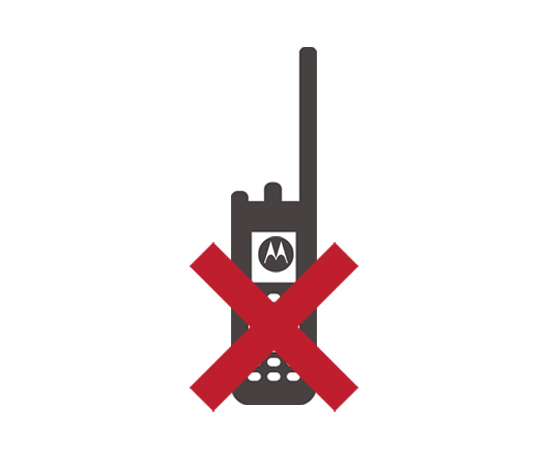 Non-authorised importers deliberately tamper with the Motorola Solutions serial number, unique to each radio product, compromising your ability to know your two-way radio, mobile or repeater is genuine. – You do not have assurance your radio is genuinely from Motorola Solutions. – Your radio’s warranty is void if it cannot be identified as genuine. – Your radio’s point of origin cannot be verified and you, therefore, don’t have assurance it is optimally configured for use in your country. – Your radio’s performance has not been subjected to our rigorous testing, calibration, programming and field testing processes – only available from authorised channel partners. 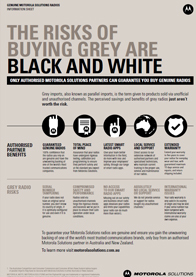 Buyers of grey radios are not entitled to claim a warranty or receive service, repairs or support from Motorola Solutions or its authorised channel partners within the Uk. – Restricted to making warranty claims from the device’s country of origin at your own expense. – Not entitled to repairs, service or support of any kind from any Motorola-certified engineers and technicians within the Uk. – At risk of using radios configured by individuals who do not have current certification and training in the proper use, service and maintenance of Motorola radios. – Unable to access Motorola’s extended warranty and maintenance plans which provide full cover for everyday wear-and-tear, shipping and guaranteed turnaround time. Only genuine Motorola Solutions partners can provide you with the full range of smart two-way radio applications which significantly extend your business’ safety and productivity capabilities. – Your MOTOTRBO radios’ and systems full capabilities cannot be realised. – You miss the broader benefits achieved from safety and productivity enhancing apps such as voice dispatch, fleet administration, GPS tracking, text messaging, email, job ticketing, alarm and lone work monitoring, voice recording and radio to broadband interoperability. HOW CAN I CONFIRM IF MY MOTOTRBO RADIO, MOBILE OR REPEATER IS GENUINE? – When purchasing your radio equipment always buy from a Motorola Solutions approved partner, there is a partner locator on the Motorola Solutions website. Grey imports, also known as parallel imports, is the term given to products – mainly electronic equipment – sold via unofficial and unauthorised channels than those authorised by the original manufacturer. NEED HELP OR MORE INFORMATION? If you are concerned about the genuine nature of your radios or who wish to discuss this practice, contact a Motorola Solutions channel partner for more details 0800 043 2688.